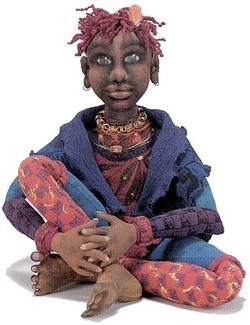 In the 1990s, Lawan Angelique made a name for herself making and selling unique, one-of-a-kind soft sculpture art dolls. Then she was ready to tackle a new medium to challenge herself as a designer. Lawan became fascinated with mosaic, drawn to its permanence as an art form after the relatively ephemeral quality of sculpting and designing dolls in cotton and mixed media. These pages represent both her past work and work in progress. Enjoy. Lawan Angelique was born in Washington, D.C. and began learning needle arts from her mother and grandmother at an early age. Her traditional education includes fine art, graphic design, theatre arts, hair design, and aesthetics. Lawan's doll making skills were self-taught. For the past 10 years, her design focus has shifted to mosaics. 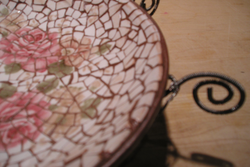 Initially, Lawan Angelique's mosaic work was Pique Assiette, using broken plates and similar media. (The name is said to come from the French pique-assiette, meaning “one who eats from others’ plates”). She also works in paper, mirror, glass, glass tile, and other media. Inspiration for her designs often comes from patterns found in nature. "Sometimes I have a subject in mind, and sometimes my designs take on a life of their own. The materials I use inspire me. My cloth heads are needle-sculpted with no underlying molds. The size of the piece usually dictates what medium I use."